In November of last year, FundStrat co-founder Tom Lee announced a pricing model for Bitcoin. The model explained 94% of the variability of Bitcoin’s price with a high degree of confidence around the variables. It was based on Metcalf’s law, which states that the value of a network is the square of the number of users on the network. As the internet has grown over the last three decades, this law has been applied to many fields beyond telecommunications and especially to social networks. Many in the cryptoasset space have discussed applying network valuation techniques to cryptocurrencies. After all, money is a social construct so each person that begins to transact in Bitcoin grows the network exponentially. Moreover, with the information contained within blockchains, much of the relevant data to make value calculations is explicit in the transaction records and addresses. Unfortunately, the data to apply network valuation to traditional currencies isn’t available — or at least I haven’t figured it out yet. At CoinScore we are working hard to build out the analytics and decision-making frameworks for our platform. We aim to help investors make informed decisions when investing in cryptocurrencies. Tom Lee provided a fair amount of detail into how he built his pricing model, so I used the information he provided as a basis to begin building out the cryptocurrency valuation framework for our platform. The result was a two-factor model that is very close to Tom Lee’s results. In this piece I will walk you through our model and provide specific examples of how it can be applied to creating forecasts for Bitcoin’s price. First, the regressors — which are the variables in the model. The main input into Metcalf’s law is the number of users, which is then squared to determine the value. 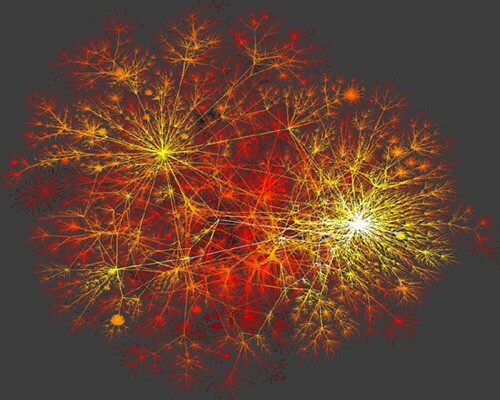 From the Bitcoin blockchain, one data element that can be used to proxy the number of users on the network is referred to as the unique address. Unique addresses are the number of Bitcoin addresses used in Bitcoin transactions for the blocks generated that day. 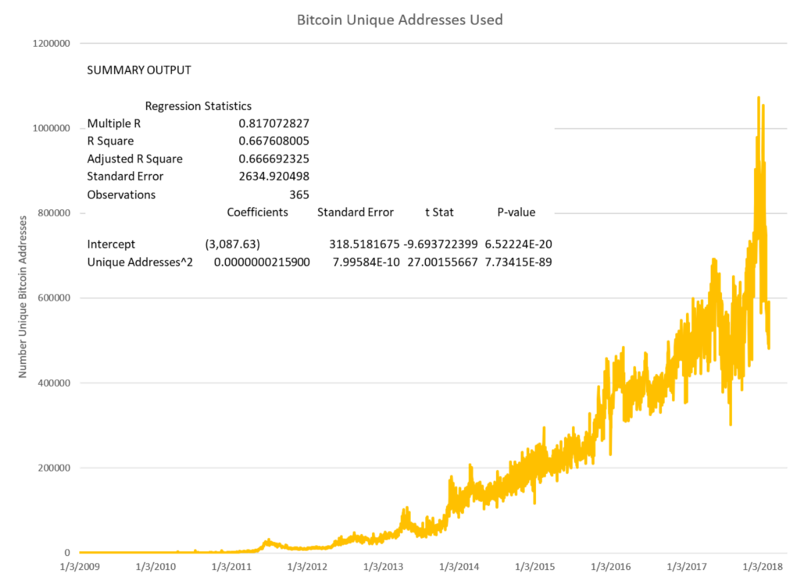 Using data pulled from Quandle, the graph labeled “Bitcoin Unique Addresses Used” displays the growth of unique addresses over time as well as relevant “Summary Output” statistics around regressing this variable again Bitcoin’s price. By squaring the unique addresses and regressing them against Bitcoin’s price in USD, you get a regression model with a correlation statistic of 82%, referred to as Multiple R in the Summary Output table. Note that the t-Stat for unique addresses squared is highly significant, meaning that there is a high degree of confidence that this variable explains the price of Bitcoin. This is a model with excellent fit, but we can improve it even further by adding the average volume of Bitcoin transactions per address, priced in USD. If there are a lot of users of a currency and each of those users, on average, make high-value transactions, this implies a higher value for the currency. 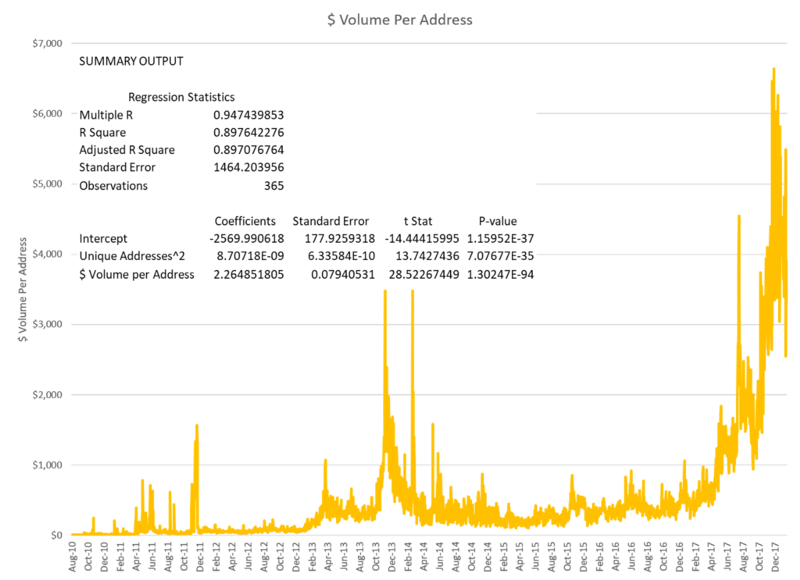 The graph labeled “$ Volume Per Address” illustrates the movement of this variable over time. By adding this data series to the regression, we have a model with a correlation of 95% to the price of Bitcoin. Again, you’ll see a high degree of statistical significance in the model. The next step is to plot out the USD price of Bitcoin and compare that to what the model predicts the price should be. 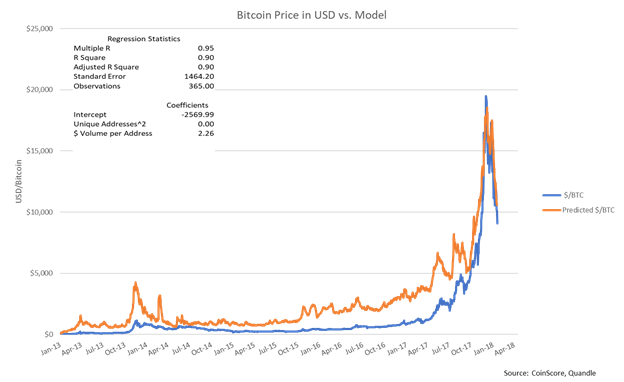 In the graph labeled “Bitcoin Price in USD vs. Model”, you can see how the USD price of Bitcoin predicted by the model compares to the actual USD price. We’ve made some proprietary refinements to the model but the essential principle is the same. With a method in place to model the price of Bitcoin, one can set about estimating the price of Bitcoin based on assumptions about changes in the unique Bitcoin addresses used and average volume of transactions per address. 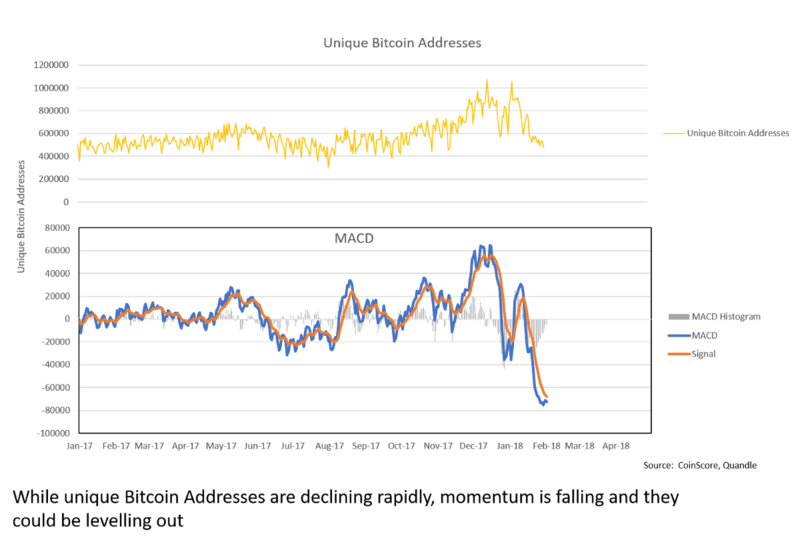 In the table to the left, we illustrate the sensitivity of Bitcoin’s price to changes in Unique Addresses and/or $ Volume of Transactions based on our model. One thing we learn from these scenarios is that, according to the model, the price of Bitcoin is more sensitive to changes in the average transaction size per address than changes in the unique addresses. You can see this by comparing Scenario 1, which holds unique addresses constant and increases transaction size per address by 20%, to Scenario 3, which does the opposite. The model has Bitcoin’s price rising 25% (from $9,565 to $11,089) when we increase average transaction size compared to a 9% rise (from $9,565 to $10,452) when we increase unique addresses. We can learn a lot from scenario analysis. A good model can reveal fundamental principles about the thing being modeled, as well as the model’s limitations. However, drawing conclusions about the future direction of Bitcoin’s price still requires a prediction. We need to predict both unique addresses and average transaction size per address. There are many methods to approach this, but we will apply MACD technical indicators to both variables. Note that I don’t consider myself a technical analyst in any way, and feel free to critique my interpretation. My purpose is to illustrate that even with a model, you still have to make predictions about the future path of the regressors if you want to estimate the future price. The approach that I am illustrating here is just one of many potential approaches to forecasting variables and arriving at a model predicted price. It is incumbent upon any investor to formulate their own hypothesis and perform their own analysis to have confidence in their conclusions. In the chart labeled “Unique Bitcoin Addresses,” we take a look at this variable. It is clear that unique Bitcoin addresses have been falling at a rapid pace since early January. However, it seems that the decline could be losing momentum given the convergence of the MACD and Signal lines. For purposes of illustration, we will model the price of Bitcoin assuming no further decline in the number of unique bitcoin addresses. Next, let’s apply the same analysis to Bitcoin Volume per Address in USD. 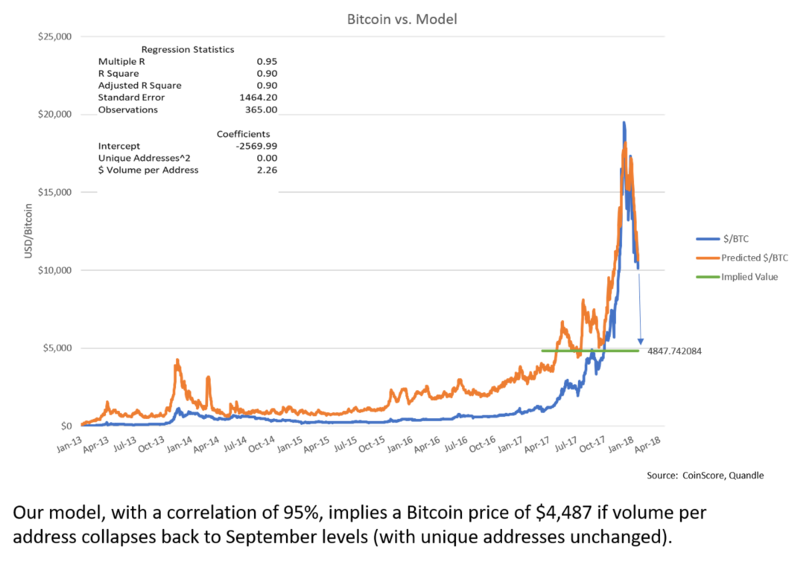 Recall from our scenario analysis above that our model implies the price of Bitcoin is far more sensitive to the average size of transactions per address than to the total number of addresses by nearly 3:1. This variable has experienced a similar rapid decline (See “Bitcoin Volume per Address in USD” chart). However, to my eye, the momentum does not seem to be declining as the MACD line is below and diverging from the Signal line. If we assume that the decline will continue, then how far might it fall? To come up with an estimate for a decline in Bitcoin volume per address, let’s refer to our recent analysis on Tether. In “UnTethered: Tether’s Failed Promise”, we laid out statistical evidence that strongly suggests much of last year’s Bitcoin price increase can be attributed to the remarkable increase in USDT — or U.S. dollar-linked tether. Furthermore, we presented evidence based on forensic accounting techniques that suggest the increase in USDT may not have been backed by actual U.S. dollars. The increase in USDT issuance during the final quarter of 2017 was particularly notable. Based on the above assumptions, holding Unique Addresses constant and dropping Bitcoin Volume per Address to September levels in our model, we get a model predicted price of around $4,800 (shown by the green line labeled “Implied Value” in the “Bitcoin vs. Model” chart on the left). 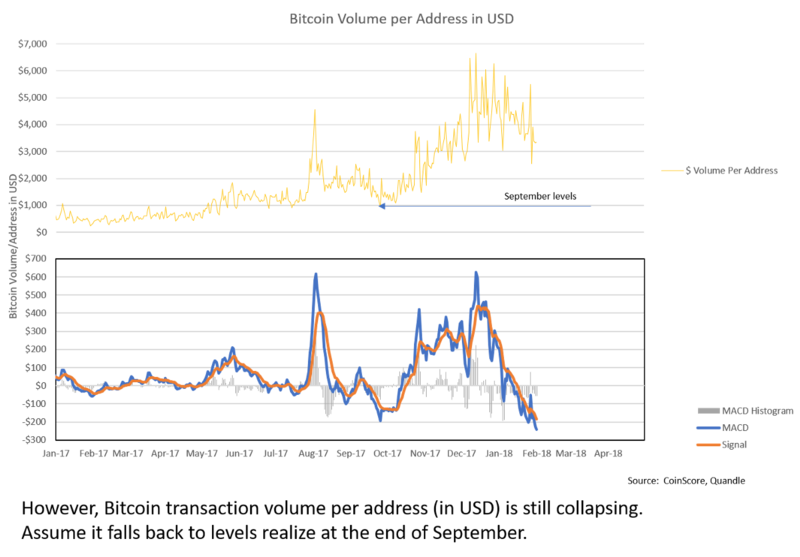 It’ll be interesting to see if average transaction volumes per Bitcoin address continue their decline and if the price of Bitcoin continues to fall. Models are tools, not crutches. They help us understand fundamental principles and clarify our thinking, not replace it. The goal of this paper was to show one approach to modelling the price of cryptocurrencies based on a network theory of value (h/t to Tom Lee for good details about his approach). We also provided an example of how to predict those value drivers using a popular technical indicator, though there are many ways to approach this. At CoinScore, our team is building a platform that places a variety of valuation models and analytics at the fingertips of cryptoasset investors. By connecting blockchain level data to valuation frameworks native to the CoinScore system, such as the one we explored today, investors will have powerful tools to inform their investment decisions. Be sure to visit coinscore.io to see what we have built so far.